At a quinceanera in San Francisco, 19 people were sickened – including a 6-year-old child – after reportedly consuming gummy candies that were available as refreshments at the birthday festivities. Now, investigators with the San Francisco Police Department have said they believe the “candy” was in fact a form of edible marijuana and they are exploring whether the candy might have been placed there intentionally. If it is shown the candy was knowingly placed there as a means to harm children, officials said, that would be, “a serious crime.” Still, officials said they wouldn’t rush to that assumption. Thirteen of the 19 people who fell ill were under the age of 18, with the youngest being just 6-years-old. The party was for a 15-year-old girl. Preliminary tests on the candy indicated it contained THC, the active ingredient in marijuana. However, further laboratory tests are being conducted so officials can be certain. Blood tests are also being conducted so that they can affirm that it was in fact that candy that made the youngsters sick. Some of the individuals did test positive for THC, which is the main psychoactive ingredient in marijuana. Authorities declined to name the Oakland-based company that provided catering to the party and also declined to indicate how the gummy candies were presented on the table. This particular type of marijuana edible reportedly is sold in packs of 10 for $25. The co-director of the local poison control center told a reporter that while ingesting these types of edibles isn’t fatal, the health effects would have been exaggerated in young children, who are smaller and for whom even small doses would cause symptoms. Most of those who arrived at the hospital suffered side effects similar to those that involve cannabis consumption, including high blood pressure, rapid heart rate, confusion and lethargy. Officials say it’s imperative that that marijuana edibles – especially those that looked like candy, baked goods or other tasty treats – don’t end up in the hands of children for whom they were not intended. 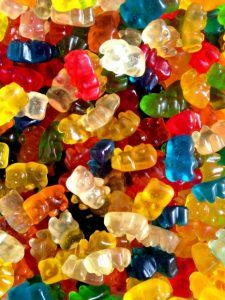 From a civil law standpoint, one might argue that the host created a dangerous situation by allowing marijuana edibles that looked like candy to be served to unwitting children without the knowledge or permission of themselves or their parents. Of course children would be drawn to such edibles, which is why such products need to be adhere to strict labeling guidelines. Here, these were orange-peach flavored sour gummy rings, though it’s not clear if the catering company served the rings or if someone brought them to the party. The gummy rings look very similar to a non-THC-containing product that is sold in regular stores. In addition to the children, two elderly men were also hospitalized. Our L.A. marijuana lawyers know the gaining popularity of edible marijuana products means manufacturers, distributors and others must be vigilant about ensuring these items don’t fall into the wrong hands. Even when it happens unintentionally, the consequences can be serious. An experienced marijuana defense lawyer will be necessary. At this juncture, all of those who fell ill were treated and have since been discharged with no long-term harmful effects.